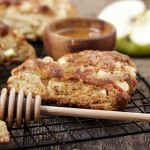 Quick and easy scones, filled with lots of diced apple, flavoured with buttermilk and sweetened only with honey. You don't even have to peel the apples! Preheat oven to 425° F. and line a large baking sheet with parchment paper. Set aside. In a measuring cup, whisk together the buttermilk and honey until honey is dissolved. Set aside. In a large bowl, whisk together the flour, baking powder, baking soda, salt, cinnamon and nutmeg. Add the cubed butter and using a pastry cutter, two knives until you ave coarse crumbs (or process lightly in a food processor then return to bowl). Drizzle about 3/4 of the buttermilk/honey mixture over the flour/butter mixture and using a fork, stir until a soft dough forms, adding more of the buttermilk mixture, as needed. You may not need every last drop. Dough should be moist (not crumbly) but not super sticky. Fold in the diced apples. Remove dough to a generously floured surface and fold over onto itself 2 or 3 times until dough holds together well. Lightly flour top of dough and press or roll into an 8-inch circle. Cut into 8 wedges. Transfer the wedges to your prepared baking sheet, allowing at least 1 inch between the slices. Brush tops with heavy cream and sprinkle with sugar, if desired. Bake for 14-17 minutes, or until puffed and deep golden. Warm 2 Tbsp. honey and drizzle over scones to serve.